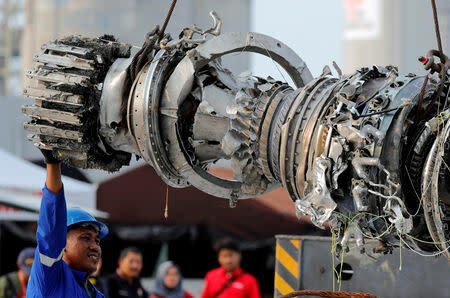 WASHINGTON/ZHUHAI, China (Reuters) - The U.S. Federal Aviation Administration issued an emergency airworthiness directive on Wednesday to address how to handle erroneous data from a sensor on the new Boeing 737 MAX jet in the wake of last week's Indonesian jetliner crash. Boeing Co <BA.N> said in a statement that it had alerted pilots to the issue. The FAA said it was mandating that airlines follow the Boeing bulletin. The U.S. planemaker said investigators probing the Lion Air crash off the coast of Indonesia, in which all 189 on board were killed, had found that one of the "angle of attack" sensors on the Boeing 737 MAX jet had provided erroneous data. Experts have said the angle of attack is a crucial parameter that helps the aircraft's computers understand whether its nose is too high relative to the current of air - a phenomenon that can throw the plane into an aerodynamic stall and make it fall. The FAA said the "erroneous inputs can potentially make the horizontal stabilizers repeatedly pitch the nose of the airplane downward, making the aircraft difficult to control." The agency said the order was effective immediately and applies to nearly 250 aircraft worldwide, including 45 in the United States operated by carriers including Southwest Airlines Co <LUV.N>, United Airlines <UAL.O>, and American Airlines Group Inc <AAL.O>. An angle of attack sensor had been changed by mechanics on the ground in Bali the day before the crash, Indonesia's National Transportation Safety Committee (KNKT) has said. Boeing said in a statement received at China's largest air show in Zhuhai that its bulletin to airlines underscored "existing flight crew procedures" designed to address circumstances where information coming into the cockpit from the sensors was wrong. Boeing's bulletin related only to the 737 MAX, the latest version of the world's most-sold family of aircraft, which has been in service for just over a year. Authorities were still searching for the cockpit voice recorder, the second so-called "black box." KNKT said it would attempt to reconstruct the jet's last flight using Boeing simulators in Seattle. The angle of attack sensor replaced in Bali would be analysed at its place of manufacture in Chicago, the accident investigator said.